Un IDE multiplateforme et libre, permettant de concevoir des programmes (dont les jeux), par The Qt Company. Qt Creator est un environnement de développement intégré multiplateforme faisant partie du framework Qt. Il est donc orienté pour la programmation en C++. Il intègre directement dans l'interface un débogueur, un outil de création d'interfaces graphiques, des outils pour la publication de code sur Git et Mercurial ainsi que la documentation Qt. L'éditeur de texte intégré permet l'auto-complétion ainsi que la coloration syntaxique. Qt Creator utilise sous Linux le compilateur gcc. Il peut utiliser MinGW ou le compilateur de Visual Studio sous Windows. Qt Creator a été traduit en français par l'équipe Qt de Developpez.com. 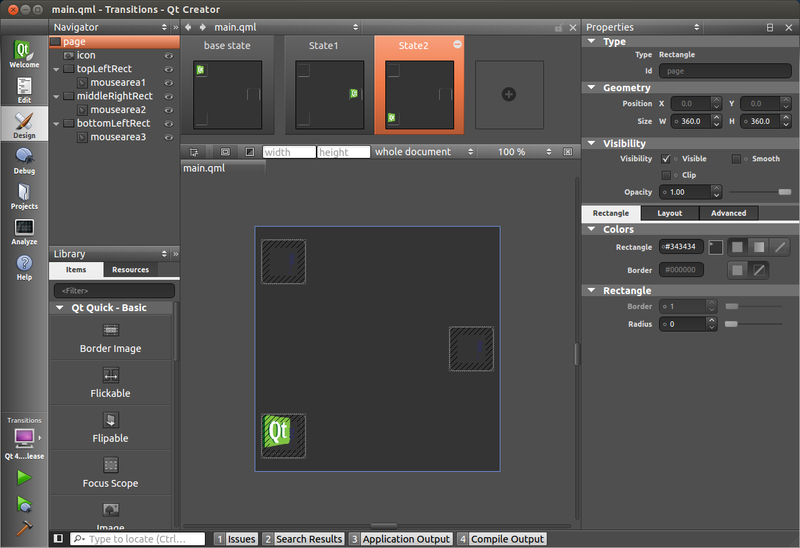 Qt Creator is a cross-platform IDE for development with the Qt framework. Qt Creator is a cross-platform integrated development environment (IDE) designed to make development with the Qt application framework faster and easier. Qt Creator includes a project manager that can use a variety of project formats such as .pro, CMake, Autotools and others. A project file can contain information such as what files are included into the project, custom build steps and settings for running the applications. Qt Creator includes a code editor and integrates Qt Designer for designing and building graphical user interfaces (GUIs) from Qt widgets. The code editor in Qt Creator supports syntax highlighting for various languages. In addition to that, the code editor can parse code in C++ and QML languages and as a result code completion, context-sensitive help, semantic navigation are provided. Qt Designer is a tool for designing and building graphical user interfaces (GUIs) from Qt widgets. It is possible to compose and customize the widgets or dialogs and test them using different styles and resolutions directly in the editor. Widgets and forms created with Qt Designer are integrated with programmed code, using the Qt signals and slots mechanism. Qt Quick Designer is a tool for developing animations by using a declarative programming language QML. Qt Creator provides support for building and running Qt applications for desktop environments (Windows, Linux, FreeBSD and Mac OS), mobile devices (Android, BlackBerry, Maemo, and MeeGo) and embedded Linux devices. Build settings allow to switch between build targets, different Qt versions and build configurations. For mobile device targets, Qt Creator can generate an installation package, install it to a mobile device that is attached to the development computer and run it there. Installation packages can be published on the Ovi Store. Qt Simulator is a tool for testing Qt applications that are intended for mobile devices in an environment similar to that of the device. Fully-stocked cross-platform integrated development environment for easy creation of connected devices, UIs and applications. We believe that delivering connected devices, UIs and applications that meet and exceed end user demands takes more than just clean code. You can’t live on intuitive and comprehensive APIs alone. We want you to be able to not only code, but to also design and create. You’ve surely heard us say “code less, create more”? Well, this is where “create” comes into play. Whether you are creating a mobile app, desktop application or a connected embedded device, Qt Creator is the cross-platform IDE that makes application and UI development a breeze. Since time-to-market is key, the IDE includes productivity tools that speed up your development time. Create visual appeal that speaks to your end users. Our integrated UI design tools help you design UIs using Qt Widgets with Qt Designer, and smooth animated UIs with Qt Quick Designer. • Expand your global market with Qt Linguist, which speeds the translation and internationalization of your applications. Support for editing C++ and QML context-sensitive help, code completion, navigation and more. All the necessary files are generated including support for importing existing projects or creating one from scratch. Multiscreen and multi-platform support for quickly switching between build targets.